"The electronic responsibility for actions and deeds." Just like in any society, the digital community needs to have some structure. Unlike the guidelines for being a strong digital citizen, the laws that are created have consequences outside of the digital world. 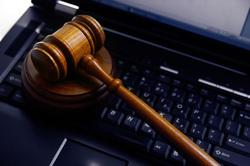 Laws are constantly updating to include issues that are being addressed in the digital community. Some of the issues include: sexting, file-sharing sites such as Napster Kazaa, hacking, identify theft. Two main issues in schools are copyright infringement and plagiarism. What is Copyright and Copyright Infringement? permission of the author, it is known as copyright infringement. own. This can include written works, websites, songs and music, artworks, and other media. What can Students do to prevent Plagiarism? Inclue the source of information when paraphrasing, or summarizing information in your work. Use quotes when using direct words from another work. Include a works cited as well as in-text citation for resources used. When in doubt, GIVE CREDIT! What can Teachers do to prevent Plagiarism? Define Plagiarism and your expectations for the students from the beginning. Provide examples of how to cite references (work cited, in-text citations, etc). An activity based on music and the Copyright Laws geared towards Middle School Students. Provides a curriculum to help students understand copyright laws. Resources including permission letters, FAQs, and how to register the students work. Interactive way of learning about Copyright Laws and common questions. A quiz found on copyrightkids.org that students can take to start the discussion and learn information on the copyright law. A web resource geared to kids from kidshealth.org that explains Plagiarism, provides examples, and checklists to help to eliminate plagiarism. Digital Citizenship by Christina Taylor is licensed under a Creative Commons Attribution 3.0 Unported License.